Do you have to share files between two Windows 7 operating system computers at your home or office? This is can be easily done by establishing a LAN connection between two computers and share files, folders, data without need of the internet. For such connection, you will need a crossover cable and of course two Windows 7 PCs that should be connected. First, you need to enable Sharing and Discovery of both the PCs with Windows 7 operating system. 1. Goto Control Panel > Network and Sharing Center. 2. Under the section ‘Sharing and Discovery , enable the option Network discovery, File Sharing, Public folder sharing and others if needed. 1. Goto Start and right click on “Computer”. Click Properties . 2. In the System properties window click “Change settings” link at middle right. 3. At “Computer description” Give each computer a description (should not be same). 4. Click on “change” to change name of the computer and create a workgroup. 6. Once you change these, you will be asked to restart the computer, so simply click OK at the prompt to restart. 4. After computers are rebooted we have to setup IP addresses to each PC. When Network and Sharing Center is opened, open Local Area Connection properties. 5. 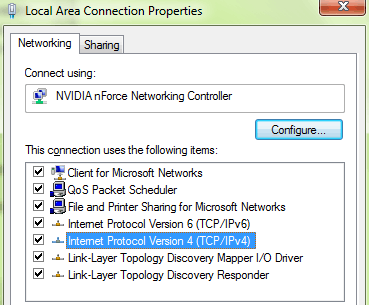 Scroll down to “Internet Protocol Version 4(TCP/IPv4)”, click it and click properties button. Then click on “Use the following IP address” and at “IP Address” type in an IP address e.g 177.152.32.1. 6. Now both PCs must have different IP addresses, (make the second PC’s IP address 177.152.32.2). 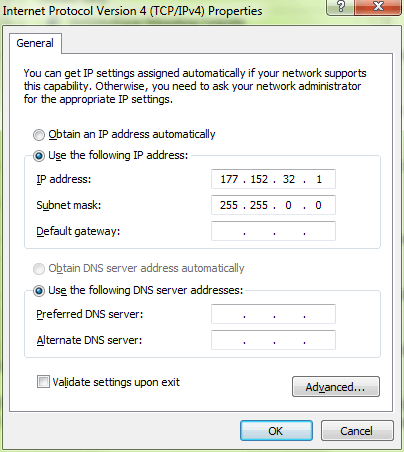 After you set the IP addresses just press the tab button (and get a number in the subnet mask as 255.255.255.0), press OK.
Connect both PCs using cross over cable and plug to each computer’s network card RJ45 port. Now will be able to see the computers listed in “Network and Sharing Center“. You are all set to share files! What happend if you create the workgroup and the computer also belongs to a domain? Is possible un-do the change and come back to the Domain configuration? I just linked my 2 computers using your tutorial at my pawn shop. This is awesome stuff. *BEER* to you!!! Thank you very much………thank you. please whene i wanted to share files it asked me password both pc. Thanks for your help. But here I can share only the public folder only. But no problem, it works for me. Thanks again. It is good news for me. I am gonna use it.